Does anyone have any reccomendations on clutch kits? I just looked a little this place had 4 different makes I read the descriptions on all & this is the page I thought sounded best but they are all there for you to read too. Make sure you get the flywheel turned before the new clutch goes in. Any warpage will cut the life of the clutch significantly. I also have to do the clutch in my SX, was looking around and was interested in this one, I know it say RACING CLUTCH, but it has a good hold for heavy loads as well. Also its not a bad price. Do be carefull about using any sort of racing clutch under normal/city driving conditions, my mother had one in her camaro (sp?) and it lasted all of 30,000 miles, if memory serves me right. It may also be harder on the clutch cable. Hey, thanks for all the help. 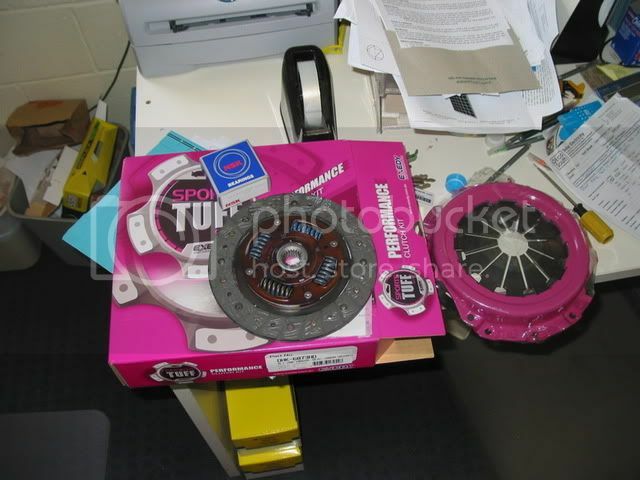 Personally I wouldnt buy a racing clutch because the Roza isnt a race car. I would guess that something for a racing application isnt designed to last a long time, but to perform exceptionally well for a short time. What I am getting is probably similar to what palmer got. exedy is a large australian maker of clutches and stuff, and they used to be called Diakin. I got the Heavy Duty Clutch, which claims to be harder wearing which is what i want. What was interesting about this experience was the variation in quotes i got for this part. they ranged from $300 - $500 for exactly the same thing. One company quoted me $310 and when i called up to order it they said that the first guy had made a mistake and it was actually $500 and they had to get it from victoria. Yeah thats where the factory is that everyone who quoted me including the last guy that i ended up buying from had to get it from as well. I have the similar experience, when doing 4x4 in hard conditions I get the smoke as well , burn smell. Would you be able to send me your supplier, So I can order one for myself. I live in South- east melbourne. The reason why i reckon i got mine at such a sick price is that I ended up getting really pissed at all these wankers trying to rip me off and i actually attempted sent through a sales order to the factory and tried to get the part under the buisnesses name. the guy at the exedy factory (which is in melbourne) called me up asking who the hell we are are and why a company that obviously has nothing to do with the automotive industry was ordering clutches. When i started ranting he seemed to think i was kind of amusing and referred me onto a company called ABS. They then called him and ordered it, called me back and said merry christmas. Look just updating this. turns out i got it for $250 cuz the supplier missquoted me and by the time he called ABS back i had already payed for it. The HD kit should cost around $350. Look, it comes in heavy duty pink! tks Bill, I\'m not in a hurry.